FILE - A person holds a sign that reads "Fund Climate Change Research - Saving the Planet Is Not a Waste of Money" during the March for Science in Washington, April 22, 2017. Scientists will leave their labs and march on Washington and more than 200 other cities around the world Saturday, protesting government policies on issues from climate change to gun violence that they say ignore scientific evidence. It comes a year after the first March for Science, three months into the Trump administration, when researchers feared that science would be pushed aside in the new president's zeal to eliminate government regulations. This year, "I think our worst fears are coming to fruition," said Chris Zarba, who retired in February as the head of the Environmental Protection Agency's science advisory board staff office. Those panels evaluate the evidence guiding decisions on government environmental regulations. Last October, EPA Administrator Scott Pruitt issued a directive that changed the rules governing membership on those panels. Pruitt barred researchers who had received EPA grants. He said agency funding could compromise their objectivity. "Whatever science comes out of EPA shouldn't be political science," Pruitt said in a statement. 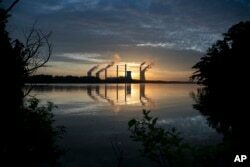 "From this day forward, EPA advisory committee members will be financially independent from the agency." But scientists with funding from the industries EPA regulates are not held to the same standard, Zarba said. "Nobody believes now that those panels are independent," he added. As the Trump administration undoes what it calls job-killing regulations on climate change, air and water pollution, pesticides and more, Zarba said industry has a voice but science does not. "Human health and the environment will suffer," he said. It's one reason Zarba said he would be marching Saturday. 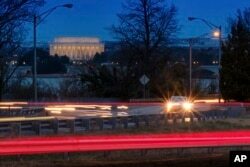 FILE - Traffic streaks along U.S. Highway 50 early in the morning, March 30, 2018, in Arlington, Va. The Trump administration announced April 2, 2018, that it would revise tough mileage standards for cars and light trucks, saying Obama-era rules were "not appropriate." But march organizers say the attacks on science did not start with the Trump administration. For decades, they say, ideology has overtaken evidence on issues in women's health, gun violence and other controversial subjects. "This isn't a new phenomenon," said March for Science Interim Executive Director Caroline Weinberg. "We reached a tipping point. But these protests should have been happening for years." In a polarized country, however, the march walks a fine line. "I'm always cautious about trying to politicize something as important as science," said Rob Young, director for the Program for the Study of Developed Shorelines at Western Carolina University in Cullowhee, North Carolina. "Certainly, scientists have had a rough go for the last year," he added, and a march advocating for science is fine. "But to the extent that that's incorporated with political messages, or slings and arrows against the president or members of his administration, then that's a little bit more problematic." It's Trump administration policies that have scientists fired up, however, from withdrawing from the Paris climate agreement to loosening air and water pollution rules. "There's no question that there's fear and anxiety, given the elections of 2016," said Chris McEntee, executive director of the American Geophysical Union, the professional society representing Earth and space scientists. FILE - The coal-fired Plant Scherer, one of the nation's top carbon dioxide emitters, stands in the distance in Juliette, Ga., June, 3, 2017. U.S. President Donald Trump on June 1, 2017, pulled the U.S. from the Paris climate agreement, striking a major blow to worldwide efforts to combat global warming and distancing the country from its closest allies abroad. She said that in the eight years she has been with AGU, it has become easier to get members to speak up on policy issues. "What we're seeing is scientists coming to us to want to engage," McEntee said. More members are writing letters to elected officials and getting training on communicating science to policymakers and the public, she said. New programs AGU launched to help scientists communicate are overflowing. And they are scoring some victories. Science agencies got a raise in the latest federal budget. "It's been a very long time, actually, since we had significant increases," McEntee noted. Scientists are wading into controversial issues that many had previously avoided. This year, March for Science organizers rallied support to lift a ban on gun violence research. Weinberg said they debated whether the issue was too partisan for the group to weigh in on. But they decided that it was more important to support research that would help policymakers make good decisions. "It's only partisan because we've let that become the conversation," she said. "Pushing against that, I think, is one of the most vital roles we can play."